Crafted in fine argentium silver for added brightness and strength, this elegant bridal ring set by Perfect Fit features an engagement ring with sparkling flower shaped diamond cluster, sitting alongside a delicate diamond set wedding band. 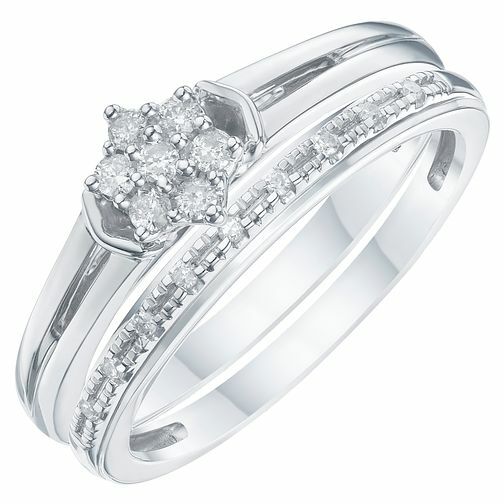 Argentium Silver & Diamond Perfect Fit Bridal Set is rated 3.7 out of 5 by 3. Rated 5 out of 5 by Anonymous from Perfect It’s everything that she wanted, the packaging and product was perfect. Rated 1 out of 5 by Anonymous from Smaller than expected Was a whole lot smaller than expected, it was as if the picture was stretched to look wider, not something I would propose with. In a nutshell I was greatly disappointed.